Newborn babies don't do a whole lot more than lie on their backs staring up at you. 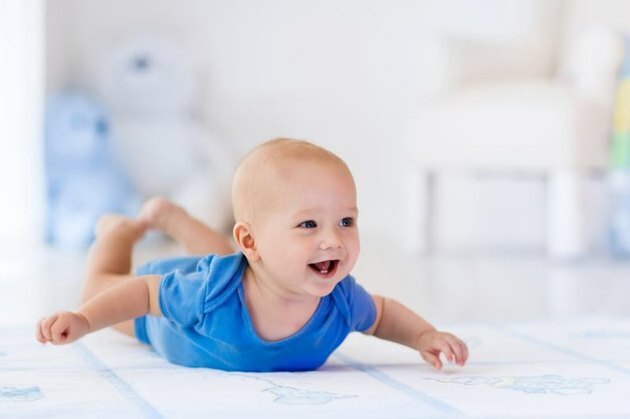 Eventually, your baby will need to develop the muscular strength to roll over, sit up, crawl and, eventually, walk. Babies do much of this work on their own, instinctively, but you can help your little one progress. Just like adults, specific exercises can help your baby develop abdominal muscles he needs to become strong and mobile. The exercises can also be a fun and bonding activity for the two of you. Lay your baby down on a soft surface, such as a sofa. Sitting at his feet, take hold of his hands. Providing as much or as little assistance as he needs, help your baby to sit up. The first time you do this exercise, you'll probably need to help him a lot; as he learns the exercise and his tummy muscles become stronger, he'll need less and less of your help. As you help less, his stomach muscles will be working more. Once your baby can sit up with your help, you can help him to stand up in the second part of the exercise. Offer as much assistance as your baby needs; don't let him struggle, which can be frustrating. Once he's standing, reverse the exercise so that he returns to a sitting and then a lying position, with as much help as he needs from you. Offer your little one plenty of smiles and encouragement as he achieves a sitting position and a standing position. It's never too early to start strengthening and stretching baby's muscles with yoga. Simply letting your baby spend time on his tummy helps strengthen the muscles of his core, including his lower back and abdominals. Around three months of age, your baby can start pushing himself up using his arms, just like the adult version of cobra pose. Being able to do this is a first step toward sitting up and crawling. When your baby is very young, you can place him on his tummy on your chest, which also creates a a bonding opportunity. After several weeks, allow him time on his tummy on a soft blanket or play mat on the floor. In the beginning, 30 seconds to two minutes a few times a day is sufficient; work up to a few 10-minute sessions each day. Babies get bored, just like adults. Keep the exercises interesting by changing them up every so often. Make a game out of the exercise, play music or sing songs. Use a mirror so baby can see herself, or involve some of her favorite toys in the routine. Your baby can roll from her tummy to her back around four months of age, and from her back to her tummy around five months of age. This takes a great deal of abdominal strength that you can help her build by encouraging her to initiate the movement. While she's on her tummy, hold her favorite toy in front of her just out of her reach. When she reaches for it, move it so it is to one side of her head. The goal is to get her to to twist her body as she reaches for it, which will eventually lead to her rolling over.